Fine art, Illustration, graphic design and the art philanthropy of Sam Morrison: SUMP WINS!!!!! The election results are in! Sure there were some voter irregularities but nothing to suggest there'd be a runoff between SUMP and the Outhouse Lobby Group. 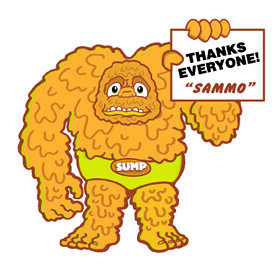 SUMP WINS IN A LANDSLIDE!! !